A U.S. passenger plane is seized by middle-east political extremists lead by Abdul (Robert Forster). 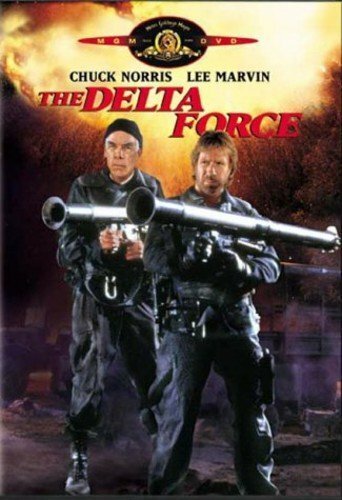 The president of the USA decides to send the Deltaforce, a group of super soldiers trained to these kind of operations leaded by colonel Nick Alexander (Lee Marvin) and Scott Mc Coy (Chuck Norris). As they are about to investigate the plane, they are told that some hostages have been carried in an other place, furthermore additional terrorists managed to get aboard the plane. The operation is a fiasco and the terrorists kill a passenger before they take off for another destination. The movie follows then a chase in order to save all the hostages and to avenge America's honor. Delta Force is one of those silly movies that I can't help but enjoy. The plot is so patriotic (nearly as Independence Day) and nearly racist, the villains are so schematic (Abdul is played by Robert Forster, yes the one from Jackie Brown! Doesn't look like an Arab, does he?). The good are courageous and invulnerable, in a word, some real American Heroes, all the more since the American flag is present on nearly every scene of the movie. The directing is not a model at all, far from it. You will probably ask me why I like this movie. Well, I still don't know! Maybe for the non-stop action, maybe for the cast (I'm always pleased to see George Kennedy). I think this movie could be compared to KFC: it's big, it's fat, it's nauseate but in a incomprehensible way, we like it with a guilty pleasure! "Delta Force" is presented in full screen. And for a movie from 1986 the picture looks clear, the black is deep andthe few artifacts are barely noticeable. A good job. A single English Dolby Surround soundtrack is proposed with French and Spanish subtitles. Relatively to the age of this movie, the sound is good. The surround speakers give some nice but rare effects and the front speakers are well used giving a good impression. A brainless, enjoyable, popcorn movie destined for the boys (my wife threatened me with a divorce when she saw this movie). Leave your brain to the hatstand before inserting this DVD.